BSNL has decided to re-launch its promotional Free Data Offer for those Smart Phone users (Andriod, Apple iOS, Blackberry OS, Windows OS, BADA and WebOS etc.) who are not using BSNL GSM Data services for last one month. As per the latest information, BSNL's mobile customers who haven't used data (mobile internet) services in April 2017 will get 1GB free Data with 30 days validity. BSNL will send SMS to those customers intimating the Smartphone Offer which is activated on their number and its validity period. How to Start using BSNL Smartphone Offer? On getting SMS confirmation regarding activation of Smartphone Offer, customers may send sms START to 1925 to start mobile data services on their number. To check data balance, just dial *124*2# or send sms STVENQ to 123. As reported earlier, BSNL initially introduced Smartphone Offer in March 2017 in an attempt to promote digital India drive and to increase internet users in prepaid mobile services. 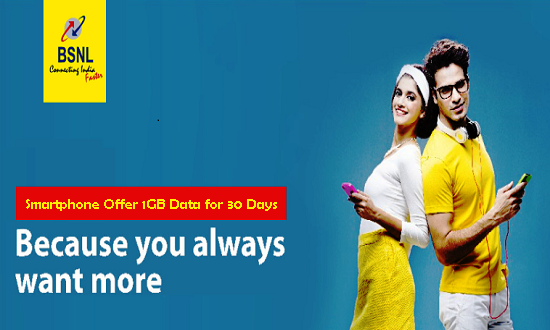 This free data offer will encourage the smart phone users to experience best BSNL Data services.